White Lion Publishing, 9781781318270, 176pp. 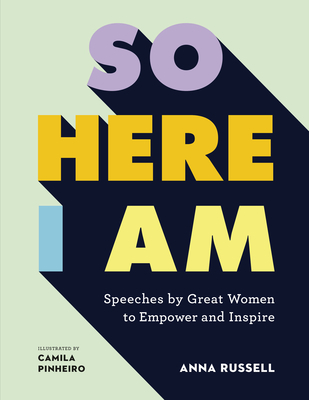 The first dedicated collection of seminal speeches by women from around the world, So Here I Am is about women at the forefront of change—within politics, science, human rights, and media; discussing everything from free love, anti-war, scientific discoveries, race, gender, and women's rights. From Emmeline Pankhurst's "Freedom or Death" speech and Marie Curie's trailblazing Nobel lecture, to Michelle Obama speaking on parenthood in politics and Black Lives Matter co-founder Alicia Garza's stirring ode to black women, the words collected here are empowering, engaging, and inspiring. New Yorker writer Anna Russell introduces each speech with a concise bio of the remarkable woman who delivered it. Paired with powerful illustrations from Camila Pinheiro, the unique personality of each woman is brought to vivid life. A pink ribbon keeps your place in the book. The women: Elizabeth I; Fanny Wright; Maria Stewart; Angelina Grimké; Sojourner Truth; Victoria Woodhull; Sarah Winnemucca; Elizabeth Cady Stanton; Mary Church Terrell; Ida B. Wells; Countess Markievicz; Marie Curie; Emmeline Pankhurst; Nellie McClung; Jutta Bojsen-Møller; Emma Goldman; Nancy Astor; Margaret Sanger; Virginia Woolf; Huda Sha'arawi; Funmilayo Ransome-Kuti; Eva Perón; Helen Keller; Eleanor Roosevelt; Shirley Chisholm; Ruth Bader Ginsburg; Sylvia Rivera; Simone Veil; Indira Gandhi; Margaret Thatcher; Ursula K. Le Guin; Barbara McClintock; Corazon C. Aquino; Naomi Wolf; Severn Cullis-Suzuki; Wilma Mankiller; Toni Morrison; Hillary Clinton; Wangari Maathai; J.K. Rowling; Angela Merkel; Sheryl Sandberg; Ellen Johnson Sirleaf; Asmaa Mahfouz; Manal al-Sharif; Julia Gillard; Malala Yousafzai; Emma Watson; Jane Goodall; Michelle Obama; Gloria Steinem; Beatrice Fihn; Alicia Garza; Maya Lin.